The Water and Sewer Department is responsible for the operation and maintenance of the Township’s water and wastewater facilities. The Township owns and operates a potable water distribution system that services a portion of the Township. The distribution system includes approximately 58 miles of water main and two water reservoir tanks. The Township provides water service to approximately 7,200 customers. The northern portion of the Township is served by the City of Bethlehem’s water distribution system. Township Well located at the Former NJ Zinc Company Mine Site – The Township has a potable water well at the site of the former New Jersey Zinc Company mine located off Camp Meeting Road. This well is permitted to withdraw up to 100,000 gallons of water per day. In addition, the Township has constructed a water blending station at this location. The purpose of this facility is to blend water from the City of Bethlehem with water from the Township well. By blending the Township’s water with the City’s water, the hardness of the Township’s water is reduced to more acceptable levels. Township Wells located at the Colonial Crest Subdivision – The Township owns and operates two wells at the Colonial Crest (Pond’s Edge) subdivision which is located near Gun Club Road in the southwestern portion of the Township. These wells are permitted to withdraw up to 290 gallons per minute (GPM), and 450 GPM, respectively. The water from these wells are distributed throughout the Township’s water system. Gun Club Well – The Township owns and operates a new potable water well off Blue Church Road South. This well is permitted to withdraw up to 400 GPM. The water from this site is distributed throughout the Township’s waster distribution system. The Township’s sanitary sewer system is designed to collect and transport wastewater to the Township’s wastewater treatment plant located near PA Route 378. The collection system is comprised of approximately 96 miles of underground pipe ranging from 8 inches to 30 inches in diameter. There are three pumping stations in the system: Old Bethlehem Pike, Spring Valley, and near the Saucon Valley Country Club. The Township provides wastewater service to approximately 7,000 customers. The wastewater treatment plant operates in accordance with the Pennsylvania Department of Environmental Protection NPDES permit No. PA0053147. Approximately 1.2 millions gallons per day (MGD) flow through the treatment plant. 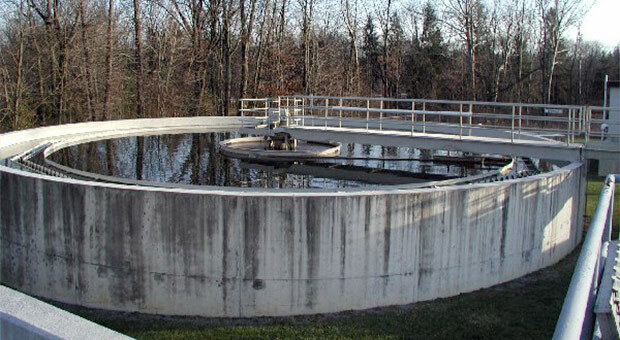 The treatment plant employs biological and chemical treatment processes to attain an effluent quality which consistently meets Pennsylvania Department of Environmental Protection permit requirements. The wastewater process facilities consist of four influent pumps, a mechanically cleaned bar screen, a grit removal system, an activated sludge secondary treatment system, two secondary clarifiers and disinfection by ultraviolet radiation. Treated effluent is discharged to the Saucon Creek. Sludge handling facilities at the plant consist of a mechanical thickener and two aerobic digesters. Digested sludge is disposed of through incineration. Click here to see a diagram of the wastewater treatment plant process. The Township’s collection system flushing program is intended to prevent blockages in the sewer lines. Each year, tens of thousands of linear feet of sewer lines are cleaned, through the use of the Township’s sewer jet vac truck. Rebuilding and rehabbing manholes in the collection system to reduce inflow sources. Raising manholes in known floodplain areas. Installing plastic manhole inserts to reduce inflow through manhole covers. Using recently purchased flow monitoring equipment to identify main segments that are nearing capacity or to help locate potential sources of infiltration. Slip lining thousands of linear feet of sewer lines to repair cracked or broken joints. Using TV inspection equipment to see the inside of sewer lines and identify sources of infiltration. Approximately 20,000 linear feet of sewer lines are TV inspected annually. Click here to see what the inside of a sewer line looks like. The Township recently recorded a reduction in peak flows during wet weather conditions which suggests that the infiltration/inflow reduction program is working. If the I/I reduction program is successful, the Township has the potential to provide additional sewer service to the community without the need for costly capital improvements at the sewer treatment plant. Upper Saucon Township has employed the use of an emergency notification system to keep residents informed of emergency situations that may arise within the Township. Notification scenarios include water, sewer, weather, and other public safety emergencies. You do not need to be an Upper Saucon Township Water or Sewer customer to enroll – in fact, we encourage all residents to enroll. Create or update your profile here. The Upper Saucon Township Municipal Authority was recently awarded the 2015 Excellence Award for Collection System Operation and Maintenance. This award recognizes facilities for their outstanding maintenance and operation of wastewater collection systems. The Upper Saucon Township Sewer Department has been very proactive preventing inflow and infiltration (I&I) throughout the forty miles of sanitary pipe in the Township’s wastewater collection system. The department utilizes slip lining of old pipes, mortar and spray lining of manholes, and flow meters to prevent and detect I&I issues.